7-20-04 – Gardening in shade is a rich, rewarding adventure. There are definite benefits to gardening in partial, dappled, or full shade. Partial shade areas receive only morning or afternoon sun, or short stretches of sun throughout the day. Dappled shade areas receive direct sun filtered through a loose tree canopy, and are equitable to partial shade. Full shade areas have buildings or dense tree canopies that block all direct sunlight, and are relatively dark even in midday. Don’t fret—the plant pallet for shade is huge, including many bountiful bloomers. Shade means less work; the amount of time spent watering is reduced, and the annuals, perennials, trees and shrubs that have adapted to shade are generally less demanding than their sun-loving counterparts. As is true when choosing plants for a sunny landscape, focusing on each plant’s form and foliage is the secret to creating an attractive garden in shade. In partial shade, start with Heuchera (Coral Bells), a genus of 8-24” tall, mounding perennials featuring fabulous small to large, lobed leaves in a hypnotic rainbow of patterns and colors. ‘Amber Waves’ features ruffled, gold leaves that age to amber; ‘Amethyst Mist’ sports small amethyst-colored leaves with silver tones; ‘Chocolate Ruffles’ has chocolate brown leaves with burgundy undersides visible at the ruffled edges; ‘Strawberry Candy’ features green leaves marbled with silver. There are over a dozen more great varieties. All bloom via arching, slender scapes holding tiny, bell-like blooms ranging through white-pink-red-purple. Full shade calls for ferns. Whether tall or relatively short, the broad, curving, feathery form of their fronds adds structural backbone to even the darkest corners of a property. Athyrium is a popular genus of ferns that do well in even the shadiest places, provided soil is rich in organic matter and not allowed to dry out. A. filix-femina (Lady Fern) has light green foliage and grows 3’ tall. As I mentioned in the March issue, A. niponicum ‘Pictum’ (Japanese Painted Fern) is the coolest fern in the world, and was named Perennial Plant Association 2004 Plant of the Year. It quickly forms a dazzling, 18” tall clump of arching, silvery gray and green fronds ribbed with purple. The reason some gardeners feel befuddled when faced with shade is that they gardened in full sun for years—until the trees in their yards started maturing and knocking out the sunlight. Don’t fret, adapt. 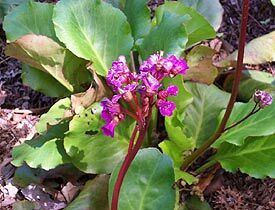 Only partial-to-full shade allows one to grow Bergenia, as delightful a combination of large, rich green foliage and arresting bloom as can be found in any garden. These early spring bloomers sport cabbage-like, evergreen leaves that look good all season, before turning a marvelous purplish-red in fall. B. ‘Winterglod’ sends up thick, rhubarb-red, 15” stalks that erupt with large clusters of red flowers. B. ‘Eroica’ grows a bit taller and blooms voraciously in light pink. Just because you garden in shade doesn’t mean you can’t grow tall, commanding plants with spectacular bloom habits. Try Cimicifuga(Bugbane) wherever striking vertical accent is called for. Plants grow best in partial shade but will tolerate full shade. Some gardening is required, but you can handle it: Amend soil with ample organic matter and have it tested if you are not sure your soil is slightly acidic (pH around 6.0 to 6.5, common across most of the Twin Cities). Don’t let the soil dry out. Now stand back — C.racemosa can hit 7’ in flower, each flower head a 2’, curving bottlebrush of fuzzy white blossoms. Varieties of C. ramosa feature dark purple foliage and ivory blooms with plants standing from 4-6’ tall by midsummer. The shade-gardener’s world includes more and better options for groundcovers than are available to those on the sunny side. My favorite big-leaved groundcover is Asarum canadense (Wild Ginger), a low-maintenance 8-10” tall spreader with green, heart-shaped leaves that completely shade out weeds. Stick it anywhere you’re tired of hosta—it’s a great edger and always looks wonderful in curving swaths. The snazziest shade groundcover is surely Lamium (Spotted Dead Nettle), which flourishes in all but the darkest reaches. Plants grow 6-8”tall and feature intricately variegated foliage and recurrent, bell-like blooms in white-pink-purple. 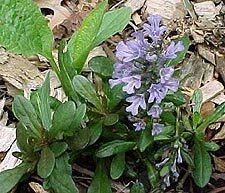 Varieties of Ajuga spread quickly to form a tough, low carpet of self-contrasting form and color, with variegated leaves that range through combinations of green-blue-red-ivory-bronze-purple. Their spring/early summer spikes of profuse blue blooms are delightful as well. Pachysandra(Japanese Spurge) flourishes around the base of trees, shrubs, even under benches, with a short, upright habit and glossy green leaves. The newer ‘Variegata’ sports white margins on silver-mottled foliage. 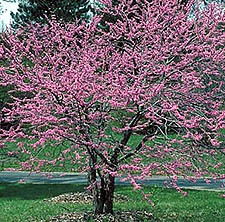 Cercis canadensis ‘Northern’ (Redbud) tops the list of most beautiful small shade trees, and was developed at the University of Minnesota Landscape Arboretum. Early spring bloom is a fireworks display of rosy pink flowers followed by large, unusual, heart-shaped leaves. Grows best in morning sun/afternoon shade or lightest dappled shade. 20-30’ high by 20-25’ wide. Either the single trunk or clump forms of Cornus alternifolia (Pagoda Dogwood) are sculptural perfection, fragrant yellow-white spring flowers held throughout sublime horizontal branching (think “pagoda”). Know how to prune and start shaping it in its fourth year and you can create a tree that would sell your house were it on fire. 20-25’ high by 20-25’ wide. 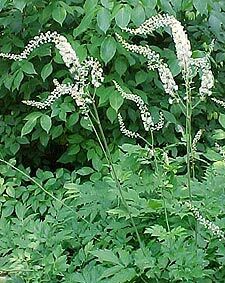 Varieties of Amelanchier (Serviceberry) grow 20-30’ tall and make glorious tall hedges in light to partial shade. All feature showy white spring flowers. The new ‘Glennform’ is most columnar, reaching 20’ but retaining an 8’ width. Leaves turn a wonderful mix of yellow-orange-red in fall. CG: Should I just give up on trying to grow grass in a shady yard? RG: Not only should you give up, you should have given up long ago. If you’ve tried a shade mix of grass seed and it didn’t make it, you’re being told something: grass won’t grow there. Funny thing is, only fifty years ago we wouldn’t know a thing about this nearly salacious desire some have to grow grass on every inch of their properties. If the area demands use for children’s play, cover it with shredded hardwood bark and be done with it. If not, plant shrubs and small trees, or a woodland garden. Maintaining a shady landscape involves no more time than the time you’ll spend trying to grow grass, then watering, fertilizing and mowing the grass should you find success, which you won’t. CG: Shady yards/gardens tend to have a more natural/woodland feel. Can you have formality in the shade? 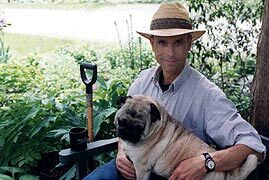 RG: It’s difficult, first because the kinds of plants that define formal design—the tightly columnar evergreens, the best hedge plants for precise shearing—either don’t grow or develop loose form. Second, you’re fighting against the hand that nature dealt you. If it’s shady, there are trees, and if there are trees, it’s woodland. Conversely, it’s like putting a wood picket fence around a stately brick home in the city. Iron fencing is going to look better, though I have no idea why. CG: Is there such a thing as too many hostas? RG: Oh, you’re setting me up. If you love hostas, if you have all their names and dates purchased on your computer, and a garden plan showing exact location of each variety, God bless you. There are countless worse addictions. I grow about seven gorgeous hostas, though I tend to forget their names and call each of them Oreo margarita ‘William Shatner.’ If you are new to gardening, I think it’s better to think about hostas as one of a hundred excellent plants for shade, instead of the only one. CG: Any flowering, climbing vines that bloom/grow in partial/full shade? RG: Several that bloom well in partial; true full shade may bring mixed results. Climbing hydrangea (Hydrangea anomala petiolaris) blooms (white) in partial to full shade and will climb to 30’, though it blooms on old wood so it may not bloom after the coldest winters. Honeysuckle vine (Lonicera) is very hardy, and the varieties ‘Dropmore Scarlet’ and ‘Godlflame,’ if properly tended, should bloom (rose-yellow) in all but densest shade. Dutchman’s Pipe (Aristolochia macrophylla) has been found hardy to Zone 4, and it’s a very vigorous bloomer (yellow-brown) in partial shade. Then there’s Bittersweet (Celastrus scandens) that blooms well in light shade but would not be worth a try in full shade.